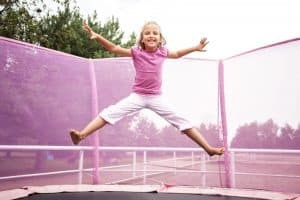 Following on from our article To Bounce or Not To Bounce?, which looked at the pros and cons of owning a trampoline for gymnasts, this buyers’ guide aims to identify the best trampolines for gymnasts and help you navigate the many options available to you once you have decided to invest in one. Style – both over-ground and ground-sunk trampolines are available. Spring-less trampolines are now also on the market. Shape – the choices are round, rectangle, square, oval and octagonal and each has specific features. Size – you will need to consider this not just with regard to the space you have available, but also the various benefits different size trampolines offer. Extras and accessories you might need – such as a ladder, safety net, installation (for sunken trampolines), a cover, spring pads and mats. Warranties and spare parts – more expensive trampolines can come with warranties which last for years while cheaper options might have very limited guarantees. Pads and springs are trampoline parts which may need replacing so be sure you can easily obtain replacements for the model you choose. The majority of trampolines on the market are of the raised variety. However, it is also possible to buy trampolines which sit at ground level. You may have one of these in your gym. Such trampolines usually require considerable installation and/or digging holes which means overall costs are typically much higher. The major benefit here is first and foremost one of safety – you can’t fall down off a ground level trampoline. Such styles also allow a trampoline to be fitted where it might otherwise be impossible such as on sloping ground. One of the more recent innovations in the world of trampolines is the Springfree trampoline, otherwise known as ‘the World’s Safest Trampoline’. This particular piece of equipment, invented by a New Zealander, is at the cutting edge of trampoline design and so radically different it has scooped a host of international awards including 2010 Product of the Year in both the US and Canada. It elicits rave reviews including an appearance in ‘The Independent’ newspaper’s 2018 10 Best Trampolines list and is featured as a top pick in the independent ‘Trampoline Review Guide’. ‘Springfree’ trampolines use composite rods rather than springs which sit under the jumping surface. This means there are no hard elements on the jumping surface itself as you would get with the frame and springs of a conventional trampoline. This feature removes two of the most common causes of trampoline injuries. The spring-free element aside, these trampolines also have several other safety features. As you might expect, Springfree trampolines are not the cheapest on the market but their ultra-safe features might make the investment worth it. Additionally, you can get away with a smaller size trampoline generally because there are no outside springs taking up valuable space. All of the surface is a jumping surface. Plenty of shapes and sizes are available with this choice. Round – Round-shaped trampolines are the most commonly found and by far and away the cheapest. These trampolines are designed for home use and are generally intended as a play thing for recreational use rather than for serious sports people. All of the springs on this shape of trampoline work at the same rate which create a soft almost ‘squishy’ feel bounce which even the smallest child can use. As the springs all point in the same direction, they also ‘pull’ the jumper towards the centre of the mat. These trampolines are OK for gymnasts just starting out who want to practice jumps, shapes, control, balance and body form. They come in a range of sizes but as they are intended for garden use are often smaller than other shape options. Rectangle – Almost all of the trampolines intended for serious sporting use are rectangular. If you have a top quality trampoline in your gym it is almost certain to be rectangular. Rectangular trampolines are typically far heavier than round models and create a more even and powerful bounce no matter where the gymnast is placed on the trampoline mat. Landings are more stable too. This is all because the springs work independently. The consistent bounce means better bounce heights and overall performance without excessive strength required which makes them suitable for even the lighter and younger gymnasts. As they are the trampoline of choice for elite gymnasts, having a rectangular model means it could last a gymnast their entire gymnastic career. Rectangular trampoline sizes range up to the super-large size as traditionally these were the choice of trampoline clubs, gymnastic facilities, sports halls and other professionals. More recently this shape has also aimed itself at the home market to provide trampoliners and gymnasts with a competition-standard choice for home garden use. As a result several smaller sizes are now available too. Due to their design, heavier weight, quality and generally larger size, rectangular trampolines are almost always more expensive than round models. However, rectangular trampolines are usually built to last. It is worth mentioning here that some manufacturers of rectangular models offer a choice of mat type. The ‘high bounce’ options tend to give around a 20% better bounce with less effort required. This means more repetition is possible before fatigue sets in. Oval and octagonal – This shape of trampoline is basically a cross between a round and a rectangular trampoline which give a bounce type more akin to the rectangular shapes. They tend to provide a larger bounce area and are also usually more expensive than round types but buying options are far more limited. Square – Essentially a smaller version of the rectangular shape, square trampolines provide a firm bounce. Springfree have a square model. Does size matter? That will depend on several factors including a gymnast’s age, level and what they want to use the trampoline for. There may also be restrictions here with regard to budget and garden space available. The general advice seems to be go as big as you can afford and can accommodate safely although you do need to be aware that going too big may work against a light or young child who lacks the strength at the beginning to achieve bounce. With rectangular trampolines the bigger their dimensions the longer and thicker their springs will be which means the bounce is powerful but not always achievable. Smaller trampolines – play trampolines aside – allow more bounce but larger trampolines give an increased size work area allowing for a greater range of activities to be more safely practised. If you buy a smaller trampoline you may have to replace it with something larger as the gymnast develops and starts to need extra space for advanced moves, tumbles and aerial elements. The most commonly found sizes for rectangular trampolines are 8ft x 12ft, 9ft x 14ft, 10ft x 17ft and 14ft x 16ft. 8ft x 12ft – great for young gymnasts just starting out, especially if they don’t have much weight. Once a gymnast starts back-flipping though this length might mean landings on perimeter pads which is obviously not desirable. 9ft x 14ft – a responsive bounce without excessive energy input which is suitable for all ages and gymnast size. The extra length makes tumbling skills more safely achievable. 10ft x 17ft – this is the size of competition trampolines. Older gymnasts needing plenty of space for linked tumbles will benefit from a trampoline of this size. As mentioned before, larger trampolines require more effort to get bounce so the trade off for lighter gymnasts here is more space/less height. This is the size of trampoline national level gymnast Beth Rowe uses and recommends. One slightly larger 12ft x 17 ft model is offered by JumpKing. This brand which has plenty of mid-range price options is well-respected among the gymnastic community and appears at the top of ‘The Independent’ newspaper’s ’10 Best Trampolines’ list of 2018. 14ft x 16ft or 17ft– a very large trampoline which makes achieving height much harder. If the principle use of the trampoline at home is for tumbling this highly spacious size could be a choice. The number one danger of a trampoline is of course falling off it. In the gym you will typically have spotters along each side, extensive matting or a floor level trampoline which can’t be fallen off at all. Most of these luxuries will not be available to you in the home environment. It is therefore essential that you have a good quality enclosure net around your home trampoline. It is estimated that as many as 4 out of 5 trampoline injuries occur from falling off according to ‘The Independent’ newspaper’s trampoline buying guide. Enclosure nets attach to the frame or mat in a variety of ways – some of them far safer than others. Typically, the higher cost, higher quality trampolines have extra net features to ensure the maximum protection possible. Enclosure nets on cheaper trampolines have hard poles to hold the net which of course can itself present an impact hazard. Mat markings – Some trampolines have a mark or logo in the centre of the jumping mat. These are very popular with gymnasts as they can help with orientation and positioning whilst in the air. Jumpking trampolines all feature a cross in the middle of the mat, whilst Skyhigh print their logo on theirs. Is it weatherproof? – Most of the home-use trampolines on the market have at least some level of weatherproofing incorporated, such as being rust resistant, as they are intended for garden use. The general advice though is to invest in a trampoline cover, especially if you have bought a more expensive trampoline. Assembly – Most are not especially difficult to assemble although they might take time. You will also need certain accessories to accomplish it which include a tool for attaching the springs. Some packages come with all you need while others don’t. Assembly is almost always a 2 person job. What’s included – Some home-use trampoline packages include all kinds of extras while others are just the bare minimum, in which case you will have to buy these separately. Be sure you know what these all cost so you can do your sums and work out which offer the best deals overall. Extras you will need might include a ladder, safety pads, enclosure net, weatherproof covers and assembly tools as discussed above (please note all trampolines featured on our site have a safety enclosure net included). Warranties – Some manufacturers are so sure of the quality of their goods and the element of being built to last they offer warranties which in some cases cover many years. Others just give you your minimum rights by law. Such warranties should give you an instant idea of life expectancies of the trampoline. Again, and just to reiterate – gymnastics moves such as flips should be never be done on a home trampoline without first having learned them at your gym with your coach. Doing otherwise is just not safe. Even conditioning exercises should be discussed with your coach first.